I managed to find a lady from Dubbo on Ebay this week who was getting rid of some her stash so I was able to get my hands on a few pieces of fabric for less than $20 in total, including postage. I’m very happy with this as I have enough for 3 projects for me plus 2 somethings for my girls plus fabric that will come in handy at some point for either linings or muslins. 3.5 metres of 88 cm wide vintage gignham. 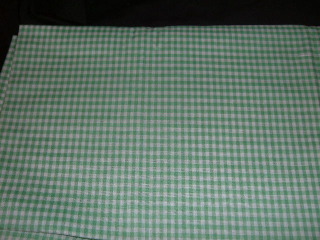 This gingham just wants to be made into a dress. I thought it would work really well for Simplicity 2588, one of the straight skirt options. I don’t think due to the narrow width I would have enough for a fuller skirt. “Mixed Bundle of Fabric…. 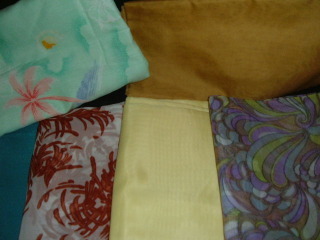 Includes Cotton, Taffeta, Silk , Chiffon.plus a few other pieces of lovely fabrics. One of these pieces is going to be used as wearable muslin for the Taffy Blouse. The pale green (picture top left) with the trees is also a good option for a dress of some kind. The chiffon in the bottom right is lovely and would love to be a gorgeous blouse but also I have enough for a dress.